Maintain an outstanding track record of performance. Have initiative, do more than is required. Develop high impact solutions and ideas. Periodically send your boss a list of your major accomplishments. Be flexible and adapt well to change. Network within and outside your department. Provide superior customer service at all times. Maintain a good attitude and be easy to get along with. Be willing to learn, be teachable. Represent your company in events, workshops and conferences. Learn the big picture about the organization and how it works. Write company blogs, articles and publications or do company videos. Develop a deep mastery of the company and care deeply about the company. Seek and use feedback well. Let your boss hear bad news from you first. Consult others, listen to others inputs, opinions and suggestions. Undertake professional development training to sharpen your skills. Take time to know the boss as a person. Understand your boss’s interests, likes and dislikes. Show ambition and desire to grow in your career. Support your manager. Feed your boss with success. Be decisive. Develop the ability to make good decisions. Respect your boss and colleagues. Build strong working relationships in your department, in other departments, with vendors, suppliers,customers etc. Be resourceful – efficiently manage scarce resources. Do more with less. Be a team player; interact and work well with others. Collaborate with others. Perform at a level higher than your current job; demonstrate you have ability and potential to move up the ladder. Stay abreast of the competition, industry, trends and regulations. Keep track of your accomplishments, quantify your results. Volunteer especially on interdepartmental projects and teams. Participate in informal company events such as staff parties. Talk to superstars in the organization, ask how they succeeded and get under their wings. Attract or bring in more money, customers or clients. Discover or establish new markets. Propose new products or services. Watch and learn how those who have been promoted do their jobs. 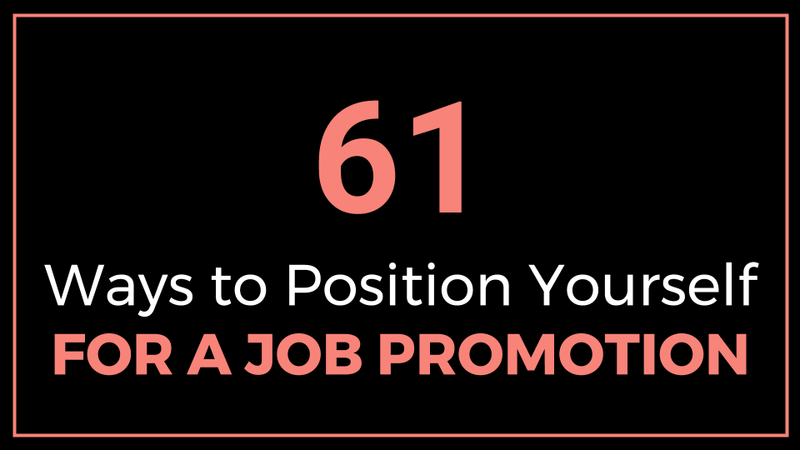 This slide presentation shows 61 Ways To Position Yourself For A Job Promotion.